First and last pulse equally usable. Marking are permanent with high abrasion resistance. High precision, fasten speed, consistent marking quality. Exceptional beam quality result into sharp and minuscule marking. Greater than 1, 00, 000 hours maintenance-free operation. Marking Depth Codes 2D Matrix, Linear Barcode Graphics Format PLT, DXF, BMP, JPT, TIF, etc. Greater than 1,00,000 hours maintenance-free operation. Real-time visible live pointer for preview your mark. User friendly interface, easy operation. 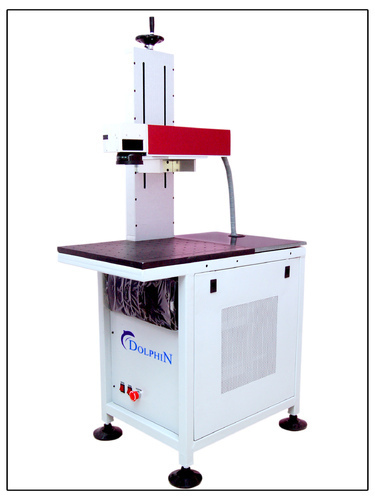 Founded in the year 2015 at Ahmedabad (Gujarat, India), we “Dolphin Laser Technology” are a Sole Proprietorship firm, engaged in Manufacturer, Wholesaler, Exporter and Trader an optimum quality range of Laser Marking Machine, Laser Hallmarking Machine and much more. We are providing SS Laser Marking Job Work Service and Laser Machine Repairing Service to our client.These products are widely demanded in the industry owing to their excellent performance, long service life and less maintenance. Backed by the assistance of "Mr. Viral Antala” (Proprietor), we have been able to provide maximum satisfaction to our esteemed clients.